Strait Area Transit Cooperative is a reliable, environmentally friendly and affordable way to get to work, school, medical appointments or even for doing your shopping and banking. 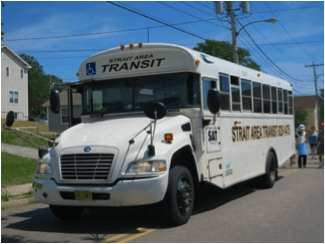 Strait Area Transit (SAT) offers a door to door Dial-A- Ride Service within Inverness Municipality for those who cannot access a fixed route. SAT also offers a charter service on evenings and weekends, this is a great way for a group to travel together to a common destination.